Gateway Stetson Hills has been part of the Colorado Springs community for over thirty years. 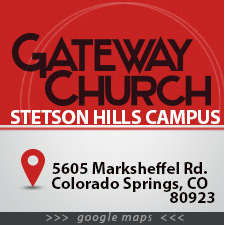 This is the hub of the Gateway Church Network. We have been in our current building on Marksheffel Road for over 7 years. We exist to create authentic Christian community and discipleship throughout Colorado Springs. 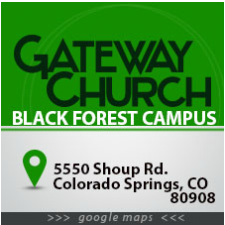 Gateway Black Forest Campus is the first church plant in Gateway Church Network. Located 20 minutes north of the Stetson Hills Campus, our Black Forest campus is beautifully tucked away in a rich landscape. This campus is perfect for northern commuters or for people who enjoy a more intimate worship setting. With a warm fireplace and a large glass window backdrop, the Black Forest Campus is cozy and inspiring.